If you need an alternative to thin-film coated filters to help you stay within budget, then Valley Design’s optical glass filters are what you’ve been looking for. Our optical glass filter is affordable, performs beautifully under varied operating conditions, functions perfectly regardless of the incident angle of light entering the filter, remains intact under stressful working conditions, and is resistant to damage from corrosive substances. Valley Design’s optical glass filters are available in three sizes from stock, but can be customized to meet your needs if they fall outside of these three readily available products. We can customize optical glass filters shape, size, tolerance, and thickness to make sure you’re satisfied with your Valley Design purchase. 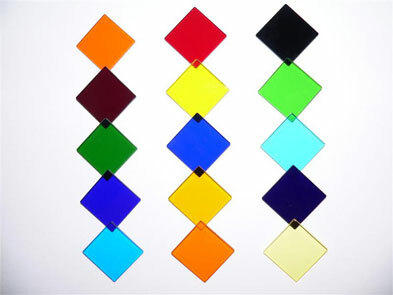 Polished colored glass filters can be used in place of thin-film coated filters as an economic alternative. For custom filter glass sizes, shapes, thicknesses and tolerances click here.